Grandfathering your subscribers into lower pricing seems friendly enough. After all, what's the harm in a discount to a loyal customer? It turns out that a serious threat to your business lurks behind that gesture of goodwill. Grandfather pricing lets existing customers continue paying the same price for a product while you change pricing for new customers. It’s prevalent throughout the SaaS subscription industry. Grandfathering kneecaps the expansion revenue you desperately need to grow and crushes your relationships with your customers. It remains one of the most pervasive yet least effective practices in today's subscription economy. We’ll take a look at the ways grandfathering hurts your business, dispatch the three common excuses used to justify the practice, and share the best way to raise prices on your grandfathered customers without making them walk away. Let’s jump right in. If there’s one foundational principle behind everything we talk about on this blog, it’s this: your price is the exchange rate on the value you’ve created. When you sell your product for the price your customers are willing to pay, you’re making a deal that benefits both of you. Grandfathering dramatically tips the scale in the direction of your customer while undermining the value you’re providing. This comes at a serious cost not only to your bottom line but to the way your customers perceive your product. If your customers start receiving additional features without paying for them, you’re actively devaluing your product in their eyes. When we combed through our data on thousands of subscription companies, we noticed a fascinating trend: grandfathered customers are actually more likely to churn than those on regular plans. This might seem counterintuitive, but it makes perfect sense. The more you charge, the more likely your customers are to stay engaged with your product. Your best customers are those who eagerly pay each month for the additional value you’re adding, not those who coast along at a grandfathered rate. Obviously, there’s a limit here - charging far above market rates for an inferior product won’t get you very far. But, if you’ve dialed in your pricing, you’re better off charging a fair rate than a grandfathered one. You don’t take your customers for granted. Don’t let them to do the same to your product. Of course, it’s easy to agree to this in principle. We all know that the specter of raising prices is enough to send some founders running . Let’s walk through the reasons why the major excuses founders and executives use to justify grandfathering just don’t cut it. Your earliest customers were the first people outside of your team to buy into your dream. They deserve to be celebrated and given exceptional customer support. They don’t, however, deserve a financial break that comes at the expense of your company. For your business to succeed, you need to continually drive growth. By charging your earlier customers a fair price, you’re strengthening the financial foundation of your business and extending your ability to continue providing your service. Increasing your prices funds your efforts to build a better product which ultimately benefits those earlier customers more than the price break you’re giving them. When we talk to companies, this is the single biggest excuse behind the reluctance to raise prices. On its face, it makes sense: no one likes paying more for the same product. Luckily, you're not asking anyone to do that. In the time since you sold your product to your grandfathered customers, you’ve improved its feature set and the user experience. 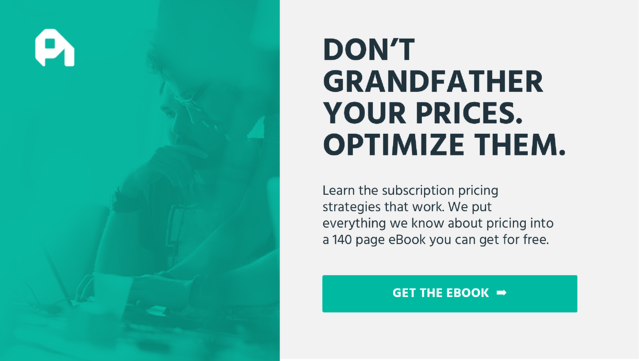 When you stop grandfathering, you’re asking your customers to pay for a product that is fundamentally different than the one you delivered at a previous price point. In our experience, it’s exceedingly rare for customers to react negatively when a price increases is justified by increased value. It follows an equally intuitive principle as the one above: when you pay more, you get more. The reason this is a bad excuse is simple: you can’t acquire your way out of a bad pricing situation. Not only is an acquisition-based growth approach 7X less efficient than a monetization based pricing strategy, but acquiring new customers doesn’t remove the financial drag that grandfathering imposes. If you had millions of customers, you might be able to get away with grandfathering a few of your earliest buyers. But, that’s not the reality for most B2B SaaS companies with customer counts in the thousands. Every customer matters to your bottom line, so it’s essential that you’re maximizing your revenue from each. Especially once you reach that $10M ARR mark, you realize that your path to $100M requires a balanced approach to growth that goes beyond bringing new customers on board. Let’s walk through the right way to get your grandfathered customers on board with your current pricing. We’re not saying that grandfathering is entirely without merit. We get it: sometimes you want to reward that customer that provided a ton of useful feedback and stuck with you despite all of your early bugs. Luckily, there’s an easy way out. We recommend gradually transitioning these treasured customers to your current pricing plan by offering them a timeboxed grandfathered discount. You can let them know that you’re going to raise the price they’re paying, but you’ll give them twelve months at their current rate before that increase kicks in. An annual discounted plan helps transition customers into new pricing. This gesture of goodwill avoids the friction of an immediate price increase while changing a permanent drag on your revenue to a temporary one. Grandfathered discounts are a way to heal your self-inflicted financial wounds without ripping the bandaid off. There are far better ways to show your appreciation for your customers than selling them your product for less than its worth. Grandfathering acts as a brake on your growth. It does tremendous damage to your relationships with your customers and makes them more likely to churn. It’s just a bad strategy for growing your business. There’s no excuse: letting go of grandfathering leaves you with happier customers and more money in the bank.